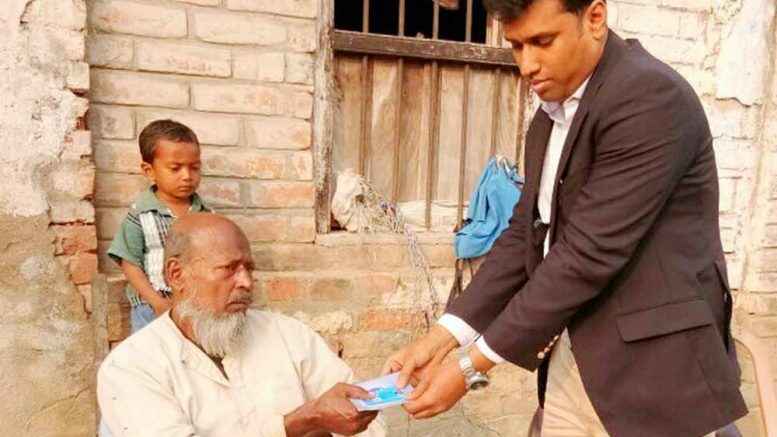 Debagram, Jan. 18: In a great gesture a young block development officer of Nadia on Wednesday visited house of a poor elderly farmer suffering from chronic kidney failure and handed him over state government’s ‘Swasthya Sathi’ insurance card so that he could resume treatment and dialysis immediately. Farmers are not entitled to get benefit under the Swasthya Sathi scheme, but the BDO took initiative to include the elderly farmer’s daughter-in-law to a self-help group so that he could become a beneficiary being her family member. 62 year old Naim Seikh of Debagram-Jumpukur village of Nadia’s Kaliganj, who discontinued treatment due to financial crisis, was surprised when Kaliganj BDO Nazir Hossain knocked his door to hand over the ‘Swasthya Sathi’ card and asked his son Saheb to arrange for his father’s treatment. 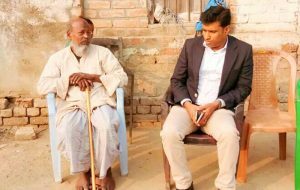 BDO Nazir Hossain took initiative to include Naim Seikh’s daughter in law Saharun Biwi to a self-help group(SHG), so that he could avail the benefit being one of her family member. As per the scheme family members including that of spouse of the beneficiaries are eligible to avail benefit under the scheme. “Swasthya Sathi” is a comprehensive group health insurance scheme introduced by the Trinamul led Government during February 2016, which offers cashless medical treatment at enlisted government and private hospitals up to maximum Rupees 5-lakh per year without paying any premium. The scheme covers 25 categories of beneficiaries like SHG members, ICDS workers, ASHA workers, civic police volunteers, civil defence volunteers, NVF, home guards, para-teachers and others. Today elderly Naim Seikh and his wife Aliya Biwi broke down in tears when they found the BDO at their doorstep. “It was beyond my imagination that a government officer could be so generous to visit house of a poor farmer like me to help. I lost hope to survive as I have nothing left to meet my medical expenses. I got some cash selling agricultural land last year, with which dialysis was started. But, it could not be continued for long. Today he told me to resume treatment”, said Naim Seikh. Naim’s son Saheb, a farmer said: “Owing to financial crisis, treatment of my father became irregular. We were compelled to sale lands to meet the expenses, nothing left to sale anymore. I was not in a position to meet the hopping expenses of his treatment which include at least 8-dialysis, each costing Rs.1200 each and injection costing Rupees 10000 per month. Moreover, I have two mentally challenged siblings, who also need regular medicine, which was also stopped”. In 2016 his Naim Seikh was diagnosed suffering chronic kidney failure. For about last two years he is under treatment at Berhampur medical college with dialysis at a private hospital. His son Saheb said: “In 2016 I requested former Kaliganj BDO to help us. But, he had done nothing. In September last year I heard a new BDO joined. I met him and requested to save my father”. BDO Nazir Hossain, a topper of 2015’s WBCS (Executive) Examination, who joined Kaliganj block in July 2017 on his first adminitrative assignment said: “It was quite difficult to help the ailing man directly. But, appeal of his son compelled us to find out a way. I discussed it with my officers and decided to bring him under Swasthya Sathi scheme by including his daughter in law to a SHG. I told the Block Women Development Officer to take necessary action in this regard. At the same time I requested the District Nodal Officer of the scheme to allow me to do it, which he approved”. Swasthya Sathi scheme’s District Nodal Officer Sachchidananda Bandopadhyay said: “It is a stupendous initiative by the BDO. The initiative perfectly served the objective of the scheme. He proved that success of government schemes also depend on sincere innovative mind”.